Savory, a hint of Tanginess and Delicious! This super simple pasta dish is packed with flavor and comes together quickly! It’s simply broccoli, artichoke hearts, sun-dried tomatoes cooked in an oh-so-good garlic white wine sauce and tossed with a gluten-free pasta of choice (we opted for Banza chickpea rotini), fresh parmesan (omit if dairy-free) and fresh parsley. Savory, a tough tangy and so yummy! A perfect weekday meal! Recipe inspired by and adapted from The Pollan Family Table. This fresh and simple pasta dish comes together quickly and is packed with flavor! Broccoli, artichoke hearts, sun-dried tomatoes and gluten-free pasta of choice (we opted for a chickpea pasta) tossed in a white wine sauce with parmesan and fresh parsley. A perfect weekday meal! Add vegetable broth. Stir to combine and let vegetable/ wine mixture simmer for about 10 minutes. Add broccoli florets to the boiling water and cook for 1-2 minutes until color brightens. Run cold water over strainer with broccoli to stop broccoli from cooking. Add pasta to boiling water and cook until al dente, generally on the low end of the recommended cooking time on the pasta package. 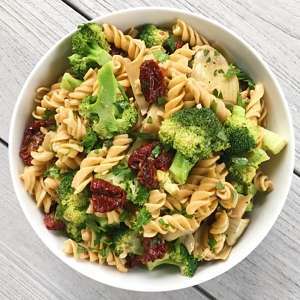 After simmering wine and veggie broth for approximately 10 minutes, add artichokes, blanched broccoli and sun dried tomatoes, and cook over medium heat for an additional 3-4 minutes to warm. Add cooked pasta and 2 tablespoons parsley and gently combine. Add reserved pasta water as needed. Add parmesan, salt and pepper to taste and stir to combine. Top with additional parsley and parmesan to taste, serve and enjoy!